Beijing-born artist He Si presents 25 different types of iris blossoms in her solo exhibition, Communicating with Flowers. Apart from the oil paintings of irises, the exhibits also include five self-portraits and three ceramic works. 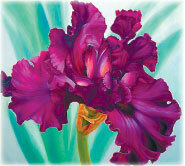 In the Irises Series, each oil painting has only one iris blossom. The petals' softness conveys a sense of clarity and simplicity that goes beyond mere external beauty. She puts different shades of color to good use to capture the flower's inner strength and energy. The series has been on display in major art galleries in the US since 2003. Chain, created in the 1980s, is an abstract ceramic work. Combining traditional Chinese artistic themes and values with Western aesthetic forms and expressions, this work was displayed at the Toronto International Art Festival in 1987 and received the Medal of Excellence in the Invitational Art Exhibition in Singapore in 1992. Beautiful images of super-realistic flower blossoms, irises in particular, are her new signature art pieces. As a nature lover, she believes the best expression of nature's beauty is flowers in bloom.